Before I started my exposition in Horstmar (Germany), November 2014, I visited the gallery "Kunstraum 4" a few times. Every time I was impressed by the area, called the Hill of Schöppingen. It is a field full of wind turbines lying in the hills. I visited the field and asked myself how it could look on a happy and colorful painting. In general, we can say so much about wind turbines and green energy. Fact is that they change the look of the areas involved totally. In my opinion, the painting must be more than realistic. Because our eyes are used to fields and hills without wind turbines. 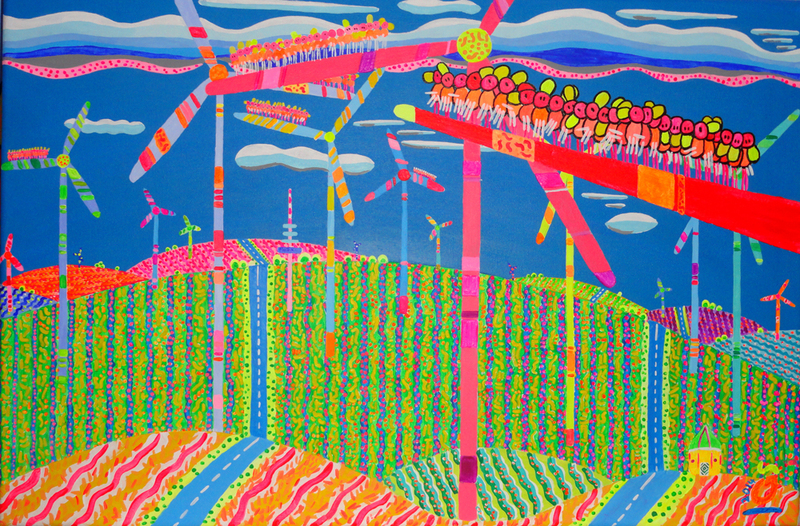 A different and happy painting can help to give the turbines a more friendly image. Fact is, they do a good job. But that’s not all. Lots of Nosybirds can be play an important role. They are sitting together on the wings of the turbines. That means there is no wind. Question is, does that mean that there is no energy at all? Sitting in this new and complete silent environment, where there is even no wind will give energy. Just by enjoying the view and enjoying the silence. And become one with a changed environment which is the result of very positive way to generate more clean energy. Different perspective.